The Dubai racing carnival reaches its crescendo at Meydan this weekend and the Dubai World Cup is the richest race meeting in the world offering over £4 million to winning connections. 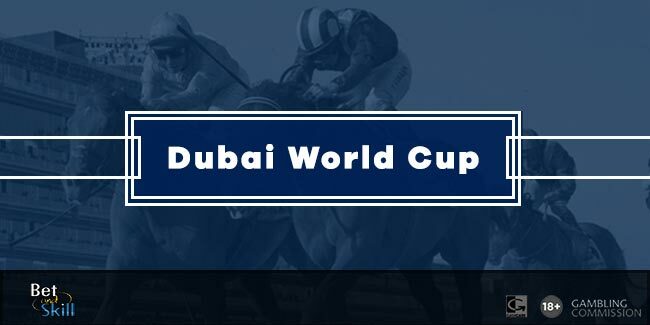 Don't miss our Dubai World Cup betting preview with free predictions, expert tips, best odds, bookie bonuses and no deposit free bets! This is one of the strongest Dubai World Cups for many years, with the American horses in particular looking top class. 2014 Preakness, Kentucky Derby winnerand last year’s Dubai World Cup runner-up CALIFORNIA CHROME will be ridden by Triple Crown-winning jockey Victor Espinoza. He has furnished into a magnificent racehorse since finishing second in the Dubai World Cup 12 months ago. His connections have taken a completely different approach to winning the race this year. They shipped California Chrome to Dubai back in January, then gave him a month working on the unique racing surface to acclimatize himself. FROSTED, who won last year’s Wood Memorial and the Pennsylvania Derby, was impressive here last month, when he looked totally at home on the surface when smoothly pulling five lengths clear of the field. He smashed the previous track record, taking more than a second off the old mark. The grey son of Tapit finished a courageous third behind Keen Ice in the Travers Stakes in August when he almost beat the first Triple Crown winenr American Pharoah (2nd that day). MSHAWISH is a last start winner of the Donn Handicap at Gulfstream Park in the US before running third to Solow in the Dubai Turf. He returns to Dubai this year having won two races on the turf at Meydan last season. Switching Mshawish to dirt has been a success and, although the competition will be stronger and the distance 200 metres longer, he may well step up again at Meydan. The one question mark is the distance is if he will he stay 2,000 metres? SPECIAL FIGHTER caused one of the biggest upsets at the Carnival when running his rivals into the ground for a solid 4 and half length win of the Al Maktoum Challenge Round III on Super Saturday. He ran on in great style under jockey Fernando Jara to win the race in a sharp 2.03.09 – a new track record. KEEN ICE has been largely disappointing since his Travers triumph, and finished 7th last time out behind Special Fighter in the G1 Al Maktoum Challenge (Round 3) at Meydan on 5th March. Furthermore, he finished 4th in the Breeders’ Cup Classic. According to the latest press reports from track-work sessions in Dubai, the blinkers seem to have worked, with Keen Ice working very well since with the blinkers applied. Christophe Soumillon rides MUBTAAHIJ, a deeply impressive runaway winner of the UAE Derby 12 months ago. He was fourth in the Belmont but he has been well beaten in both starts in Meydan, most recently finishing only fourth to Special Fighter. He was fifth on his reappearance in February and was too far back during the early stages of the Al Maktoum Challenge before finishing fourth. Andre Fabre's VADAMOS is interesting on his dirt debut after his recent second to Solow at Chantilly. Anyway, the five year old has never won a Group 1 race, and it is likely to remain that way. CANDY BOY, owned by Chechen Republic president Ramzan Kadyrov, was fourth in the world’s most valuable race last season but then fractured a splint bone and has been off ever since. The Japanese challenger HOKKO TARUMAE will be running in the Dubai World Cup for the third time. He was fifth 12 months ago and was last to African Story in 2014 when the race was staged on Tapeta. GUN PIT is an outsider despite the Honk Kong raider finished a creditable second to Special Fighter in the Al Maktoum Challenge while TELETEXT was only 7th the last time he ran at Meydan, in a moderate turf handicap for French trainer Pascal Bary. He has since been transferred to Saudi Arabian trainer Sami Al Harabi but remains an outsider. "Dubai World Cup predictions, betting tips, odds and free bets (Meydan - 26th March 2016)"